Folklore.org: Where'd That Hand Come From? Summary: How the hand and the mouse came together! In the mid '70s, I became San Francisco's first professional male hand model. That's a whole other story in itself. But for three or four years, there were no others in the field and I built a nice (and profitable) reputation, shooting hand shots for all manner of products and companies. Around April, 1984, I got a call from one of my favorite photographers, Dennis Gray, booking me for an hour, asking me to bring a variety of shirt colors, a couple of sports jackets and a suit jacket. I showed up, a pale blue shirt was chosen, and we began the shoot. I was simply to hold this weird little plastic thing in a variety of ways. After about 45 minutes, Dennis thought we had the shot. I then asked him, "What *is* this thing?" Dennis replied, "Darned if I know, they call it a 'mouse.'" A year later, I bought my first Mac, a 512. Unpacking it, I saw that virtually every surface of the boxes, plus all the manuals had this hand on it. Oddly, I didn't remember the shot amidst all the many I'd done in the meantime. It only dawned on me a few days later that it was my hand! The connection also brought me a variety of hand shots for MacWorld magazine (Dec 84 cover pictured) and I was later told that my hand was the only 'live' thing on MacWorld covers for its first five years of publication. So though I didn't have anything to do with the creation of the Mac, I did contribute to it's great marketing effort. The mouse shot, btw, paid me only $100. I don't suppose Steve would be willing to pay residuals at this late date? 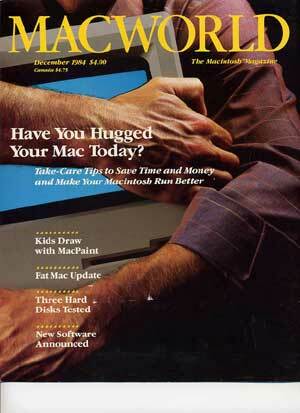 MacWorld's first issue featured Steve Jobs. I presume he was living at the time. :) I have a dealership poster that says "Test Drive a Macintosh" and features a hand (about 3' long in this case) in a driving glove. Is that your hand?